Populus tremuloides is a tree to about 20 m; 20 cm dbh; fast growing, short-lived, about 50 years; root system, shallow with vertical “sinker” roots at intervals; form dense clones, sprouting from shallow, lateral roots if primary stem is damaged (auxin mediated apical dominance stops due to cutting, burning or warm soil temperatures); roots associated with ectomycorrhizae (Basidiomycotina) including: Russula raoltii and Hebeloma spp., (Nantel and Neumann 1992); bark smooth, pale-chalky when young, dark, furrowed in age; terminal buds shiny, brown, mostly hairless; growth pattern indeterminate (Marks 1973). Leaves alternate, about 7 cm, finely toothed, dark green above paler below, petiole flat; leaves expand mid-May; winter plant leafless 167 days (Britton 1874). Flowers dioecious (some with perfect flowers), in catkins, wind pollinated, before leafing out, blooms March-April. Fruit a small capsule, seeds with white hairs, wind (sometimes water) dispersed, to several kilometers. Seeds viable only 2-4 weeks. Seedlings need bare soil and full sunlight to grow. 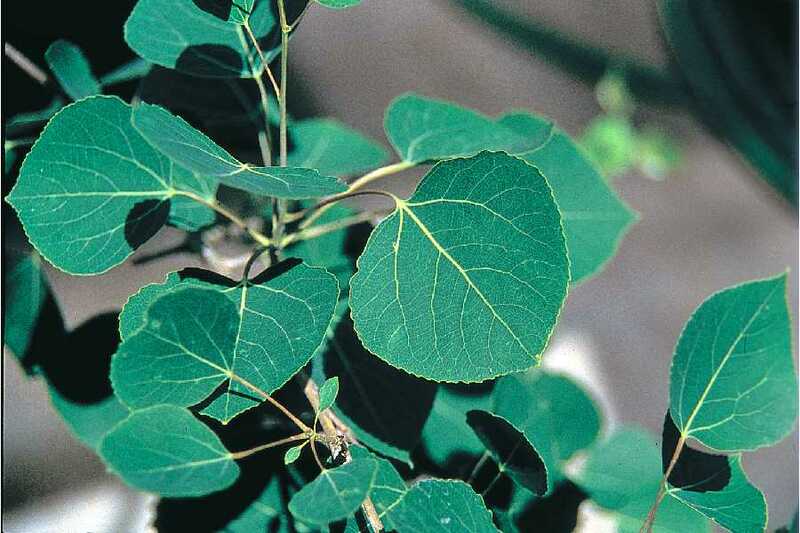 Populus tremuloides.USDA-NRCS PLANTS Database.Herman, D.E., et al. 1996. North Dakota tree handbook. USDA NRCS ND State Soil Conservation Committee ; NDSU Extension and Western Area Power Administration, Bismarck. ( Accessed 9/2014). Habitat: Aggressive pioneer on burned areas, bare soil, pH 4.3-9 (USDA, NRCS 2010). Very shade intolerant, index 0.7, lower branches die off as shaded by higher foliage, but cannot use more than 32% full sun (saturation point) (Hicks and Chabot 1985). Individual stems short lived. Intolerant of flooding, soil compaction, competition. Moderately tolerant of drought, salt (Hightshoe 1988). Referred to as less drought tolerant than white ash by Tobiessen and Kana (1974). Notes: Buds and catkins eaten by birds and mammals. Twigs and bark and foliage eaten by deer and rabbits (Martin et al., 1951). Produces open, dappled shade allowing growth of more shade tolerant species in understory. Replaced by more shade tolerant species when forest is undisturbed. Attacked by numerous diseases, insects and other animals (see P. deltoides). Bark damaged by yellow-bellied sapsuckers, which leaves rings of holes around the trunk. Young stems girdled by mice, and eaten by rabbits. Physical damage by gall insects allows access to fungi such as Hypoxylon mammatum canker and the leaf rust Melampsora medusae. 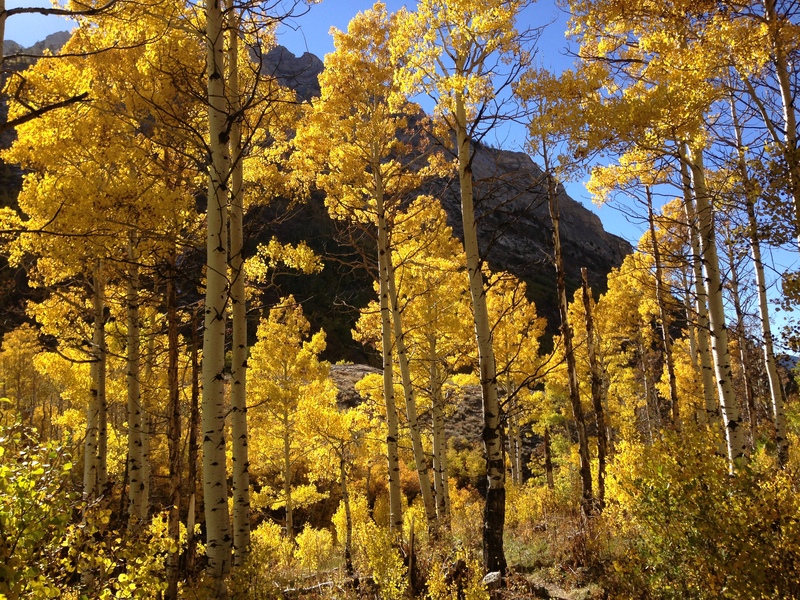 Gypsy moths (Lymantria dispar) and other insects defoliate aspens (Burns and Honkala 1990; Sinclair et al. 1987). A host tree of the Asian longhorn beetle, Anoplophora glabripennis (see Norway maple).